Ottawa, ON – KAIROS Canada and its partners will engage Canadians in a unique history lesson at seven provincial and territorial legislatures, and on Parliament Hill, from May 28 to June 5, marking the one year anniversary of the Truth and Reconciliation Commission (TRC)’s release of its Calls to Action (June 2). 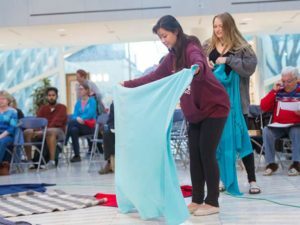 The KAIROS Blanket Exercise is a visual and participatory activity that helps people of all ages learn about Canada’s history from the perspective of Indigenous peoples. These Mass Blanket Exercises, held in St. John’s, Charlottetown, Toronto, Ottawa, Winnipeg, Regina, Edmonton and Whitehorse, are part of KAIROS’ Winds of Change campaign, launched last November, to help advance the TRC Calls to Action. KAIROS is specifically advocating for Call #62.i, which urges provincial governments to ensure that all students learn about Indian Residential Schools (IRS), Treaties, and the contributions of First Nations, Inuit and Métis peoples to Canada. Since the fall, KAIROS members and supporters from across the country have gathered thousands of signatures on petitions in support of Call to Action #62.i. Local members will deliver these petitions to Education Ministers and other provincial representatives this spring and fall. The Canadian government funded the church-run residential schools for 130 years. Former students, their families, and communities continue to suffer inter-generational trauma from the numerous abuses that Indigenous children experienced during this national project of assimilation. 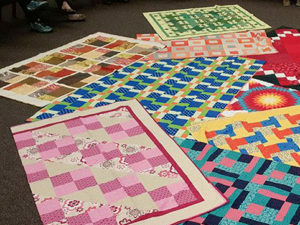 The KAIROS Blanket Exercise explores the historical milestones and impacts of colonization in Canada, including the Indian Residential Schools system. The B.C.-Yukon KAIROS chapter will mark the one year anniversary of the release of the TRC’s Calls to Action by reading aloud all 94 recommendations on the steps of the Legislature in Victoria, B.C. on June 2. 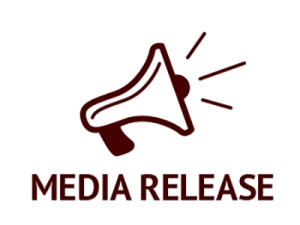 Media are invited to participate in the exercises and interview spokespeople. May 28; 12:30 – 5:00 p.m.
May 30; 2:00 – 4:00 p.m.
May 31; 5:30 – 7:30 p.m.
June 1; 2:30 – 5:00 p.m.
June 2 @ 11:30 – 1:00 a.m.
June 2 @ 6:00 – 8:00 p.m.
June 5 @ 3:00 p.m. In 1996, the Aboriginal Rights Coalition (which became part of KAIROS) worked with Indigenous elders and teachers to develop an interactive way to learn the history most Canadians are never taught. 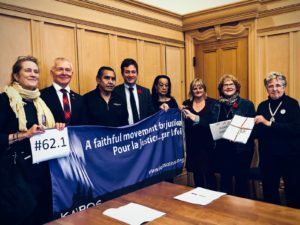 KAIROS: Canadian Ecumenical Justice Initiatives has since offered the Blanket Exercise thousands of times, presenting Canada’s history from the perspective of Indigenous peoples. The exercise uses blankets to represent the lands of what is now called Canada, and the distinct cultures and nations which live on those lands to this day. Participants represent the First Peoples. When they move onto the blankets, they are taken back in time to before the arrival of the Europeans. The Narrator and a European (or two) work with the participants to read a script while the exercise goes through the history of treaty-making, colonization and resistance that resulted in the country we today call Canada. KAIROS is a faith-based social justice organization of eleven Canadian churches and religious organizations. It focuses on Indigenous rights, international human rights and ecological justice. We deliberate on issues of common concern, advocate for social change and join with people of faith and goodwill in action for social transformation.